The ancient confusian saying, "It hasn't warmed since 1998", has been well debunked by now, but it keeps getting bunked. Today's release of preliminary global temperature data for May 2012 provides yet another nail in the proverbial coffin, however. With the latest May land and ocean average temperature taking second place behind 2010 for warmest on record, May 1998 has been pushed down to third place. And what about the other 12 years this century, beginning with 2000? 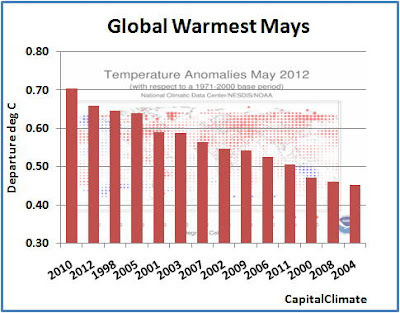 The CapitalClimate chart from National Climatic Data Center data shows that every single one of these years is also in the top 14 warmest for the month of May. interesting! although I have no expert, but I want have to know more and more, on your blog just interesting and useful information.